Total HealthCare (Sandy Springs) - Book Appointment Online! 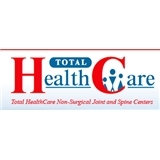 At Total HealthCare Joint and Spine Medical Centers finding the real cause of your pain is our mission. Our caring, multidisciplinary team of Orthopedic pain experts including Osteopathic Physicians, Sports Medicine Doctors, Chiropractors and Physiotherapists specialize in the accurate diagnosis and effective treatment of muscular skeletal conditions. Efficient, clean, personable, knowledgable, encouraging treatment. Very knowledgable, answered all of my questions!